Skill level: Intermediate to advanced levels are welcome. 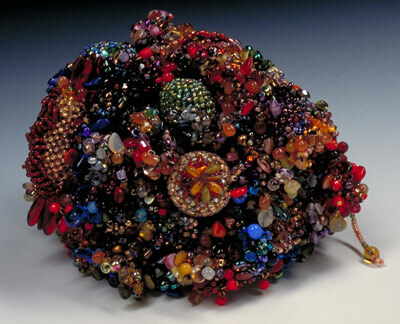 Once the techniques are mastered, the students will choose between various creative tasks, such as composing a pattern of colorful, two-dimensional stick figure shapes which intertwine playfully with one another; cover a small, three-dimensional form creating a fascinating floral pendant; or play with a self-supporting, organic form that becomes a multi-level, right-angle weave extravaganza. Each person will have the opportunity to explore the dilemmas experienced in making art while watching their work evolve. In solving the design and technique challenges, the participant will have a crafted trail of their own creative experience. Please bring small amounts of the following beads to make learning samples. High-contrast colors, please. It is easier to learn if you choose high-contrast colors that you wouldn’t want to use in a finished piece. The polymer shapes will be available for purchase on the day of the workshop. Please bring the following supplies for making your lariat or necklace. 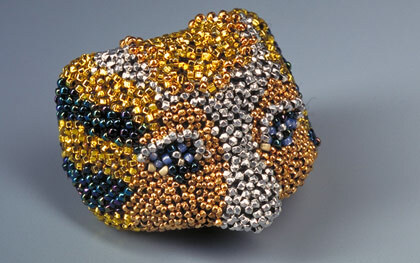 Three or more colors of size 11 seed beads and/or three or more colors of size 14 seed beads. 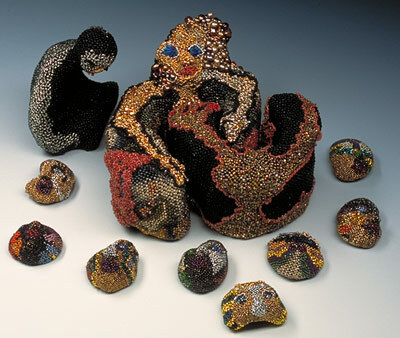 The size 14 seed beads will give you much more detail in form than the size 11s. I use a combination of both in my pieces. 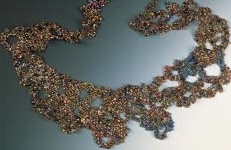 I like to use the bronze, silver, and gold tones of seed beads in my forms. You may do the same or choose a palette for yourself. Black Silamide A or Nymo Black size D beading thread. We will not be using Fireline for this project. You need black thread. Power Zap is optional but a good idea.